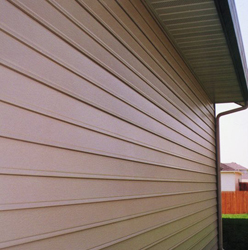 The exterior siding of your Omaha home should do more than simply enhance your house’s curb appeal. It’s also supposed to help keep rodents, wind, and rain from entering through the sheathing of your home. It should also reduce or eliminate constant maintenance and painting. Our seamless steel siding does just that! Regular vinyl siding on a typical home usually has around 130 seams, and that means those houses have at least 130 openings where moisture, wind, insects, and other pests can enter. With seamless steel siding from ABC Seamless, you can rest assured that your home’s siding will look beautiful, help prevent the intrusion of weather and vermin, and stand the test of time. 28-gauge steel construction – Unlike vinyl, our siding will not warp or crack, and it resists expanding and contracting during extreme temperature changes. Many aesthetic options – With a selection of 27 colors and 15 styles to choose from, there are hundreds of possibilities for creating the look you’ve always dreamed of for the exterior of your home. Maintenance-free protection – Our steel siding is covered with a durable chip- and fade-resistant coating that will look attractive for years to come, so you may never have to paint the outside of your home again! Additionally, your exterior siding will be backed by our limited lifetime warranty that covers peeling, rusting, fading, and hail damage. To learn more about our exterior siding as well as soffits and fascias, sunroom additions, steel roof products, house gutter options, home windows, and more, for homes in Omaha, Council Bluffs, Grand Island, and other surrounding communities, or for a free quote, contact us today.